In the spring of 1988 (March 17th), the Elder, together with three sisters of the Monastery set off by car to work on the then dirt road, which had become impassible due to the rains. At the same time they would cut grass for the Monastery's cows. 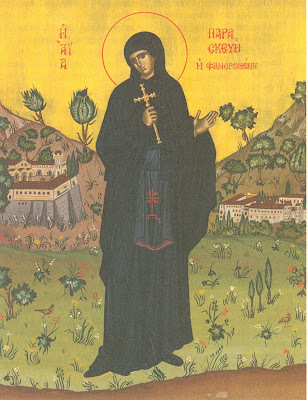 A short distance before the outdoor icon-stand of St. Paraskevi, at Stampola's field that was filled with wild flowers, they saw a woman wearing a kerchief, and dressed in dark clothing, moving slowly and bending down. She looked as if she were searching for something. She suddenly lifted her head and gazed intensely on the Elder, as if she wanted to talk with him. Her wholly-radiant and white face, along with her large almond eyes made a great impression on everyone. They passed her, however, without speaking with her. “Thus the Saints appear”, Papou replied in simplicity. Then the sisters thought that maybe this appearance was supernatural, and lamented that they didn't stop to investigate this unusual presence. 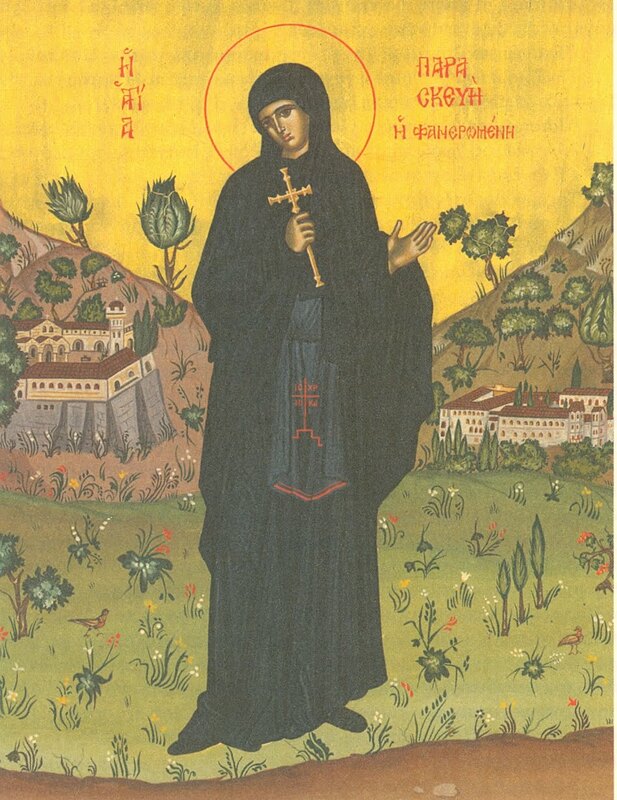 After a few days, at the end of the Divine Liturgy of Holy Saturday, one sister saw this same strange woman in church going to get antidoron from Papou. Astonished, she thought with joy: “Now you won't escape. I'll ask you who you are.” And she tried to catch her. As soon as she got closer, however, she disappeared before her eyes. She looked for her inside and outside of the Church, but she was gone! It was certain, furthermore, that her presence was supernatural. Later Papou confessed that the sight of her and her appearance had filled his soul with a divine exultation and informed them that she was St. Paraskevi. Besides this, for a while, he refused to accept this event as the Saint's appearance, as he feared being deluded. Because of this he tried to convince himself that this must have been an ordinary woman gathering plants. Of course, Papou would not accept all supernatural things as Divine, untested. For a long time, therefore, he repelled the spiritual sweetness that he sensed while remembering this meeting, thus protecting himself. However, as he said, his soul did not find rest in this state of denial, and in the end, he lost peace in prayer. Thus he understood his mistake to not accept this blessing of God. * Papou: Greek word for "Grandfather", used as a term of endearment by the nuns towards their spiritual father. Source: Biography of Fr. Damaskenos Katrakoules (+2001). Published by the Holy Monastery of St. John the Forerunner, Makrynou, Megara 2006.